Vote to enable young people to reach their potential and make a big noise in their online community. Young Bristol has over 80 years of experience working with young people in Bristol. We offer young people a range of opportunities and experiences designed to develop confidence and self esteem to take a young person to the next stage of their lives. We support a network of local youth clubs in areas of high deprivation in Bristol where facilities for young people are limited. We believe that despite government cuts, good quality youth work needs to continue and can change the lives of some of the most vulnerable young people in our city. As part of our offer to young people we have two outdoor activity centres, one in the Docks and one in the woods near Ashton court. These facilities offer young people an opportunity to be challenged and develop new skills. We also run a number of quality programmes and training, engaging with over 5000 young people a year. Further develop our communication with young people – We want to use social media to engage more dynamically with young people, to ask their opinions, to inform them of events, to campaign for improvements in services. We want all the young people we engage with to become part of an online community. Effectively involving young people in the design and delivery of our services will mean that we better reflect their needs and we can clearly demonstrate this to our funders and donors. Previously we have used social media as part of a mayoral candidate’s debate at the Station. We are excited about developing this style of communication with the help of Noisy Little Monkey and to engage more young people in political debate. Communicate with donors and supporters – We are looking at our fundraising strategy and how to improve our external message to stakeholders. We want to be more efficient and productive with the Young Bristol brand and build a larger network of supporters who can respond to us. We are the Charity of the year for the Harbour festival for the next three years and this provides us with a great opportunity to get our message out both online and offline. Develop the commercial arm of outdoor activities – To become more financially sustainable. Social media and a more effective web site will help with this. We are developing a team of business people, graphic designers, young people and freelance staff to help us become more viable in the marketplace. What we are missing is how to effectively sell ourselves online and this is where you come in. 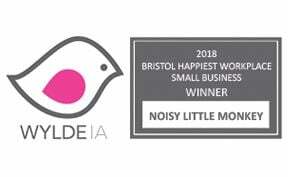 Radically revitalise our website – To reflect the ambitions of Young Bristol going forward so that it can be the center of our online community. Our current website is basic and therefore limiting how we can achieve our goals. We need help! Train Young Bristol (Staff, Volunteers and Young People) – So we can make best use of our new online facilities and maintain our online community, and ensure young Bristol is current and stays at the top of everyone’s news feeds. We're counting the number of Tweets, Likes, Pins and +1s this page gets, using the sharing buttons at the top and bottom of the page. The volume of these shares will help the judges choose who should receive our help, so get sharing! Then, really help the cause by using the Facebook comments below to tell us why YOU think Young Bristol should win £9,000 of digital marketing. GO!